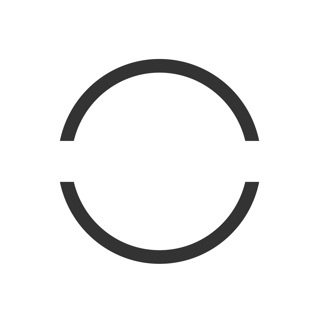 Recipe Cloud is the best Recipe Organizer and Recipes Management application for home cooks and professional chefs. 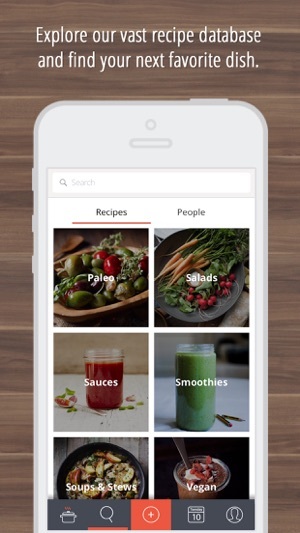 Use it to Discover, Cook, Share, Organize, Plan, and Shop with your favorite recipes. Save recipes from your favorite websites or add your own, use the meal planner* to plan your meals for the week and grocery shop using our brand new smart grocery list feature. Recipe Clouds social feeds allow you to share your recipes and cookbooks with your friends, family or other home chefs. PRO Members can now choose which recipes and recipe books are public or private. Explore our vast recipe database of nearly 200,000 recipes and discover your next favorite dish. Find your friends, or follow your favorite chef to share recipes and find new cooking inspiration. You can browse popular dishes, search for specific ingredients, or checkout our recipe categories. 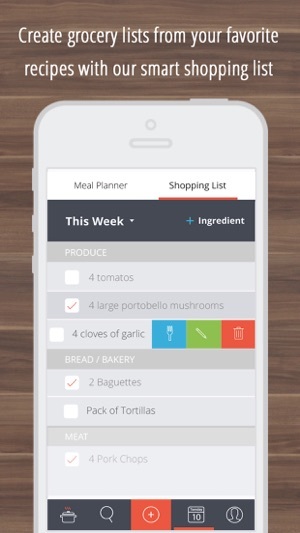 The All-New Meal planner for PRO Members helps you plan your meals for the week or month. 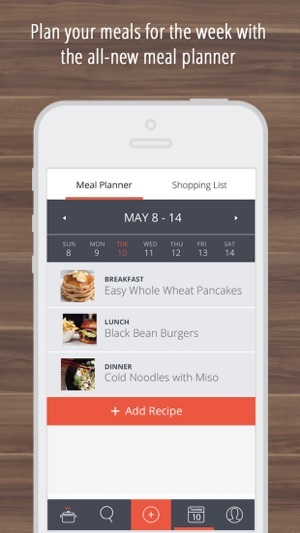 You can add as many recipes as you like to your schedule and categorize them for Breakfast, Lunch, or Dinner. Once you have your plan together, simply send the ingredients to your shopping list. Save all of your favorite recipes to one secure location. Recipe Cloud provides several ways to import your recipe content. 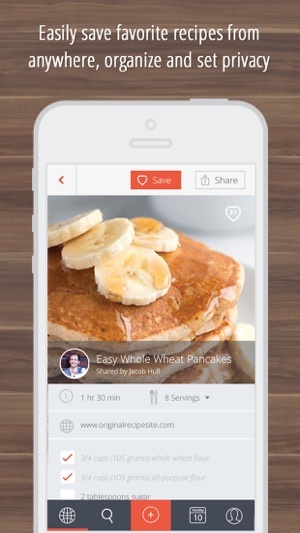 You can save recipes from friends, family or chefs directly from within the app. 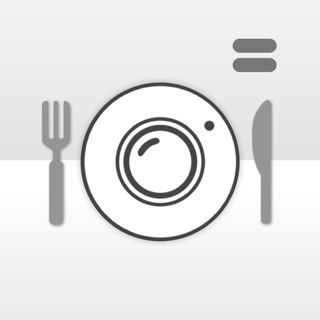 Add your own custom recipes, or save recipes right from your favorite websites or food blogs. Recipe Cloud beautifully formats all of your recipe content, into a clean, uniform and easy-to-read format. With the all-new improved web importer, you can now import most recipes from the web with a single click. Many recipes can be personal to us, maybe they were passed down through your family, or maybe you have a secret recipes that you’re not ready to share with the world yet. For those reasons, we now allow PRO members to set their individual recipes to private. Private recipes will not be visible to anyone other then you. And if you are working on a super secret cookbook, we also allow you to create private cookbooks as well. Make your own digital cookbooks with RecipeClouds social cookbook features. With books you can create collections of your favorite recipes. Such as themes, favorite chefs, easy meals, family recipes and more. LITE Accounts come with a default 3 digital books to organize your recipes. PRO members can create and keep as many digital books as you desire. 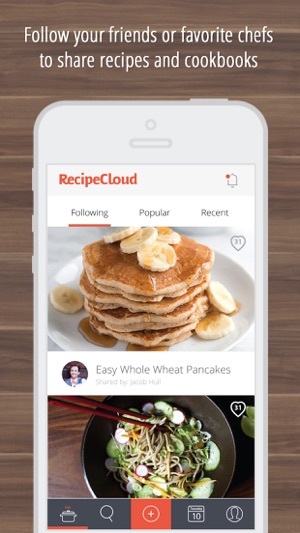 Recipe Cloud was made with cloud technology built-in, so you can access your content anywhere. Your recipes and recipe books are available on iPhone, iPad, iPod Touch and online for desktop or on any other mobile device using our responsive website. 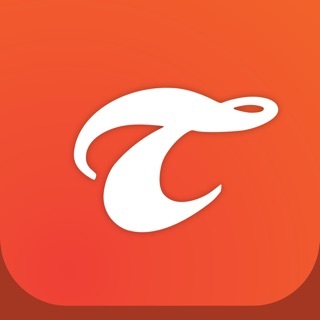 Simply download the free app and login. No syncing or purchasing additional applications. I was really excited to find this app after searching for a long time. I have used a few great recipe apps that all seem to have lost support for, but this one has all the great pieces of all of them. It's a gorgeous app. The recipe sharing and browsing is something I didn't even realize I wanted and it is awesome! I do wish there was something that measured how many people tried and recommended a recipe. The import from a website feature works exactly how I want it to. Great implementation of that feature. 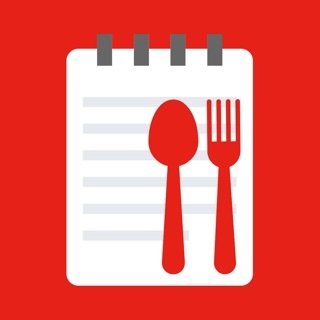 The menu planner is so much better than other apps I've tried solely devoted to menu planning. I hate subscription model in-app purchases (I would much rather pay a higher flat fee for it) but I ended up paying for the $1 a month plan and I'm not disappointed. Excited for the export recipes feature that is supposedly coming soon, but all in all a well done app. I would give 5 stars if the ads were easier to exit from. The ads are confusing to decline. The import feature is amazing, however the safari integration doesnt work as good, it goes to drafts and you still have to delete it and reimport from a link.